The growth of the moving industry in Canada is closely linked to the macroeconomic recovery, evident through increased disposable incomes, corporate relocation and sustained activity in the commercial real estate sector. The entire packing and moving process can prove unyielding and expensive if you are working on a strict budget and have a lot of stuff to pack and move. Planning your move will ensure your belongings are protected during the transfer. Your packing supplies list should include boxes of varying sizes, tapes, stickers and markers for labeling. Other helpful supplies include bubble wrap, clipboards and packing paper for wrapping delicate items like glasses. Packing supplies can be bought from a moving or storage company depot, mail service center and/or office supplies outlet. During packing, the boxes with heavy items should be clearly marked and placed at the bottom to prevent damage and to help movers direct the boxes to the right place for unpacking. You can make the tracking process quick and easier by writing down all the items inside the boxes in a notebook. 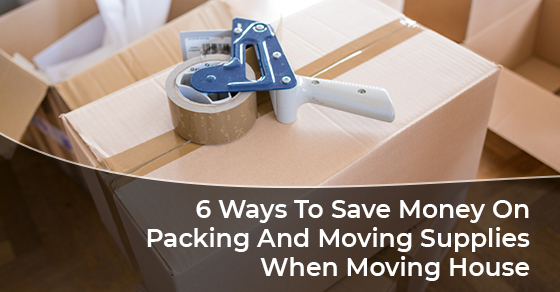 Here are 6 packing and moving tips that will help you save money and time on packing and moving supplies when moving. If you have a lot of items to move, think about renting or buying plastic containers. There are several discount chains that sell or offer plastic containers for rent. You can also borrow moving containers from family members or friends to save money. The containers should be labeled appropriately to ease the packing and unpacking worries. Cost-efficient garbage bags can act as storage for clothing and bedding. If you want to clearly see what you are carrying inside the bags, it is best to go with transparent bags. Items like towels and linens can also be improvised as wrappers for delicate items. If you have sturdy, used boxes lying around the home, use them to pack some additional items. When taping the boxes, make sure the top and bottom areas are properly sealed to prevent any fallout. If you are using the services of a mover, let the carrier help you carry the large items. The boxes with delicate, small items can be safely tucked inside a private car. You can start by establishing a packing station at home. Items from various rooms should be packed together with appropriate labeling. Fragile items like breakable dishes are best packed in bundles of about 5, each with a wrapping paper covering. The bundles should then be safely stored inside a box in a sideways direction to ease breakout stress. The dish holder can also be used for this purpose. Items like picture frames should be packed tightly using clothes, cardboard, wrapping sheets and bubble wrap. Electronic objects like TV’s can be tucked safely in the original purchase box, specially woven plastic crates or wrapped in quilted furniture pads. The other option is to secure your TV using a double box. Care should also be taken when packing expensive pieces of art. For instance, oil paintings should never be wrapped or packed using print publications. The rates charged by movers usually vary depending on factors like time and season. Movers may offer discounts to clients who make early bookings or those that choose to move during off-peak seasons. Always try to avoid scheduling your moves at the end of the month, during weekends and public holidays. One of the best, money saving moving tips for your upcoming move is shopping for competitive rates. Whether you are considering a short or long distance move, you are strongly advised to do a little bit of research by going online to check and compare quotes from various movers. When making your decision, you need to consider the mover’s reputation and the benefits you can get from additional services. You can actually make money by selling the stuff you do not need when moving homes. If the move is planned ahead of time, you can organize a yard sale around your compound to sell the items you do not need. Unwanted stuff can also be sold online through sites like Craigslist and eBay. This will help reduce the box load. The extra infusion of cash can also help fund part of the moving budget. The full storage facility caters for both short and long term storage needs. The company also prides itself in providing high levels of security and service convenience at competitive prices. Customers also enjoy unbeatable incentives such as low-priced personal storage for a day, seasonal pricing and storage discounts. A friendly team of staff is always at hand to help you with all your storage needs. To get in touch with Jiffy Self Storage experts, give us a call at (416) 74-JIFFY(54339) or contact us here.